Turn your attention skyward early this Saturday morning for a gift from Halley’s comet: A stream of up to 15 meteors per hour is predicted for the peak of the Orionid meteor shower. Shortly after midnight, viewers can expect a steady pace of meteors streaking from the constellation Orion. This year the scene may be particularly majestic because the moon, Mars, and the star Regulus will be making a simultaneous appearance in the eastern sky. The white crescent moon will form one corner of a triangle with blue Regulus and red Mars at the other two vertices. Orionids may be seen diving through this triangle in the hours just before dawn. 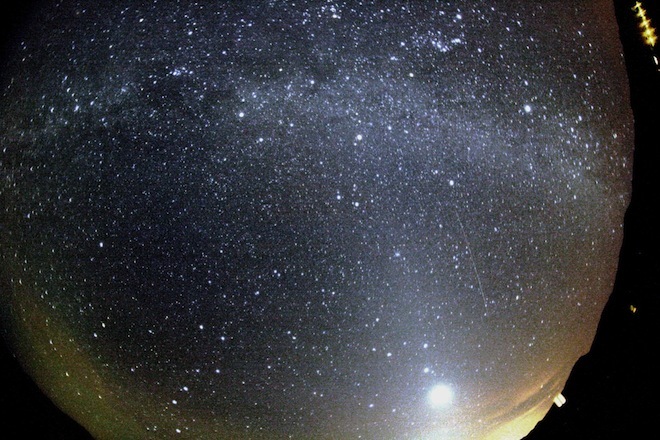 The Orionids are chunks of dirty ice from Halley’s comet as it makes its 76-year-long orbit around the sun. Pieces that break from the comet fall into the Earth’s atmosphere, creating bright flashes. Some of these may also hit the moon, a body with no atmosphere to intercept them. Astronomers will be keeping a lookout for the explosive impact of these plummeting icy hunks with the lunar surface using their telescopes. You can keep a lookout for them with a backyard telescope.